Honestly, I don't know where to begin. This was truly way more than I had expected! I think it is interesting to note that this is written & illustrated by a contemplative Monk using a "pen name" and from the whole tone of the book I would guess that he is a relatively young man. So let's start on the basic entertainment level. The artwork is fantastic! Done in a manga style with exaggerated facial expressions and the occasional chibi, mostly in black & white but with several full colour sequences which are outstanding. Extremely humorous which brought a smile to my face frequently, especially in the portrayal of the skeptic party-loving Erc. The book has a good story and plot as a framework. Set in space these two friends are interplanetary mail carriers who eventually are thrown into prison when they are framed for transporting illegal drugs. Brendan and Erc are amazing characters! They have two very distinct and different personalities and they look very different from each other but they are friends and equals conversing intelligently with each other while maintaining completely opposite philosophies of life. And this is where the meat and purpose of the book comes into play. 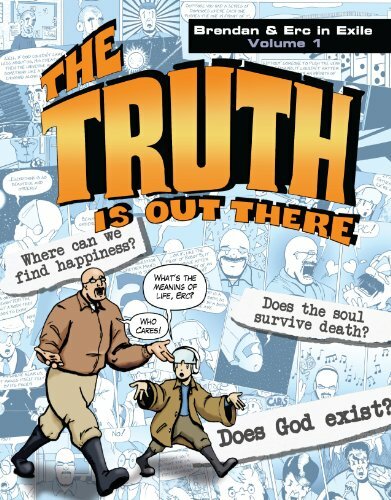 Inside this original graphic novel is an amazingly intense and deep theological discussion suitable for teens and new adults. Brendan is a questioning fellow and starts the age old conversation of why we are here? what is the meaning of life? They meet a few people along the way who explain about reason, the soul and eventually God. I was literally blown away with the depth and rationality of these discussions of the Christian faith from a Catholic perspective. Each discussion would include the one explaining with the answers being challenged with hard, serious, skeptical questions. One progresses through the book examining why we are here, what is a soul, is there life after death, who is God, what is a Christian, why should one become a Christian, what need is there for Church and why choose Catholicism. Truly, truly brilliant discussion!